Our contractors specialize in home insulation techniques designed to improve home comfort and reduce monthly utility bills. From attics to basements, blown-ininsulation to cellulose, Dr. Energy Saver has the expertise and experience to get the job done right! We offer Free Estimates on any of our insulation services to Ohio residents. Contact our company today to schedule an appointment or to find out more about our insulation services. 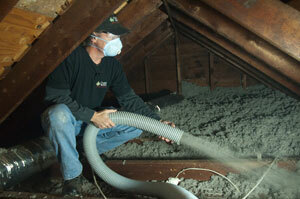 Dr. Energy Saver is your trusted home insulation company in Ohio. Our company offers homeowners quality residential insulation solutions capable of reducing heating and cooling costs by 30%. Our certified, highly trained contractors utilize fiberglass, radiant barriers, cellulose, spray foam insulation, and blown insulation to help homeowners transform their energy draining home's into comfortable and affordable energy saving living quarters. What is the Best Home Insulation Option? There is no "best" insulation. Certain insulation materials work best in certain parts of the home, for example, you wouldn't use rigid foam board insulation in your living room or your bedroom. Different types of insulation vary in price. We have been insulating households for years, so we know first-hand what insulation is best for the specific home application. Let our energy professionals decide and handle the insulation materials for your best energy saving opportunities. Air seal leaks before insulating. For insulation to be most effective, air sealing leaks must be taken care of first. Almost more importantly than installing insulation, sealing air leaks must be done before any insulation installation. Without properly installing insulation, heat can move right through the insulation itself, revoking your insulation's heat resisting value. What Makes A Good Home Insulation? Homes with inadequate insulation, such as above, waste almost 30% of extra heating and cooling costs. Poorly insulated homes make HVAC systems work twice as hard to reach ideal temperatures. What is R-value? R-value is basically the measurement of an insulating materials resistance to heat flow. For your memory, the "R" in R-value stands for resistance. Generally speaking, the higher the R-value, the higher the resistance and the greater the overall materials' insulating value is. Rockwool batt insulation, for example, has an R-value of about R-3.2 per inch; whereas, cellulose insulation can range from R-3.60- R-3.90 per inch. Proper installation makes a huge difference. For an insulating material to achieve its highest R-value rating, correct installation must be adhered to. Proper insulation is important for energy savings during hot and cold weather conditions; keeping the hot out in the summer and the hot inside during the winter. Properly installed insulation can make your home more comfortable and less dependent on your heating and cooling systems. Contact us today for a Free Estimate for any of our home insulation services in Ohio neighborhoods. 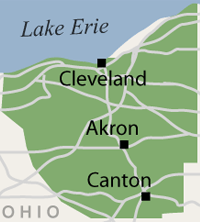 We're proud to offer our home insulation services to Cleveland, Canton, Akron, as well as Lorain, Elyria, Massillon, Medina, Strongsville, Lakewood, Chagrin Falls, Hudson, Cuyahoga Falls, Ravenna, Bedford, North Royalton, Westlake, North Olmsted, Wooster, Painesville, Alliance, Kent, North Canton, Beachwood, Barberton, Willoughby, Gates Mills, Stow, Brunswick and all surrounding areas. Call 1-888-370-6924 or contact us via online for a free home energy audit and insulation estimate.